Where Should I Apply To Med School? 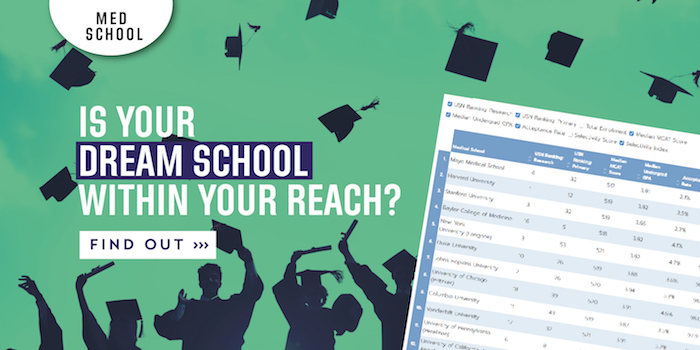 Which medical schools will be best for you? How should you go about selecting the medical schools to apply to? These are two of the most important and strategic questions you’ll have to answer during the application process. These decisions will directly impact how you navigate the med school maze and will increase your chances of getting accepted. Step 1: Consider Cost – How Many Schools Can You Afford To Apply To? It can cost thousands of dollars to cover one application cycle, not to mention your time and energy throughout this yearlong process. If you qualify, you may want to consider applying to the Fee Assistance Program (FAP) that is offered through the AAMC to assist students from economically disadvantaged backgrounds by offering a reduced price for the MCAT and waiving the application fees to 15 medical schools. Most of the schools will also waive the secondary application fee, if you apply with FAP. In the past, some medical schools also provided financial assistance to students for travel to their school, but this has become less common. It would require students to ask for this assistance, if they would otherwise be unable to attend the interview. Step 2: School Research –Where Do You See Yourself Going? 1. Where would you like to practice medicine? Some medical schools offer special programs to students who want to practice in specific regions or work with a particular patient population. If you can narrow your options using these two criteria, this winnowing process may help you locate programs that offer special training or specialties connected to these choices. If you don’t yet have a specific focus within medicine, being aware of your flexibility can help you choose programs with a broader spectrum of training. Also, having a personal connection to a location can help your application. 2. Where can you claim residency? Using the MSAR, you can identify how many in-state and out-of-state residents any given medical school will accept. When selecting schools, it is important to take this calculation into consideration. Depending on the state where you are from, you may have a higher chance of gaining acceptance at a local medical school. 3. What are your areas of interest? If you have lots of research experience and want to continue to conduct research during medical school, there are some medical schools with more opportunities in this area than others. On the other hand, if you have little to no research experience, there are also programs out there that do not consider research a requirement. Knowing which schools place importance on certain activities can help you decide, based on your personal background, where to apply. Often, reading the school’s website, talking to outreach officers, current students and your pre-health advisor can help you identify what is important to their program. You need to choose schools to apply to where you have a chance of getting in. That doesn’t mean that you shouldn’t take a few chances if you feel you have a reasonable shot at a hard-to-get-into program – but you’ll need to seriously evaluate your competitiveness (compare your stats, talents, and experiences with the expectations of your target school) before putting these schools on your list. The advantages of talking with your premed advisor or Accepted consultant include accessing our knowledge of the schools and years of experience in assisting students in gaining admission to programs across the country. Helping you select the schools that will match your interests and qualifications and value your background and experience is our area of expertise. The more time that you spend now in selecting the right schools will improve your application strategy and help you achieve your professional goals.